After 14 years of exile, the Godfather of Chimurenga music, Thomas Tafirenyika Mapfumo touched down at the Robert Mugabe International Airport on 18 April ahead of his first performance on home soil since his unceremonious departure to the United States of America. His home coming could not have been any better as he literally became the talk of town, fans and followers revisited his popular statements, songs and character that became synonymous with rebellion with the system. His show never looked possible four months ago and only became a reality the day pictures and videos of him at the airport made rounds on social media. Mukanya who arrived in the country a week before his big day, took time to meet his family, friend and fans who he had last meet more than a decade ago and some musicians inspired by the Chimurenga music icon like Jairos Chabvonga were elated at meeting their icon back in his mother land. In street corners and offices, Mukanya was the most discussed topic, no wonder his show had arguably one of the biggest crowd for a local musician on home soil. At his press conference, Mukanya was in his usual outspoken character, taking a dig at the government for running down the country, calling for the nation to embrace the young generation who still have ideas that can take the country forward. Asked about his alleged rivalry with Oliver Mtukudzi, Mukanya said music is not a competition but all about identifying yourself and doing own things which are different from others. Upcoming musicians, Gary Tight and Andy Muridzo also had time to meet the Chimurenga music legend who left the country when they were still toddlers and had nice words to say about the man endeared by many for lifting the Zimbabwe flag high on the international arena. A lot of things shocked Mukanya, music piracy, state of the roads, cash shortages and many other things that have gone out of shape in Zimbabwe. 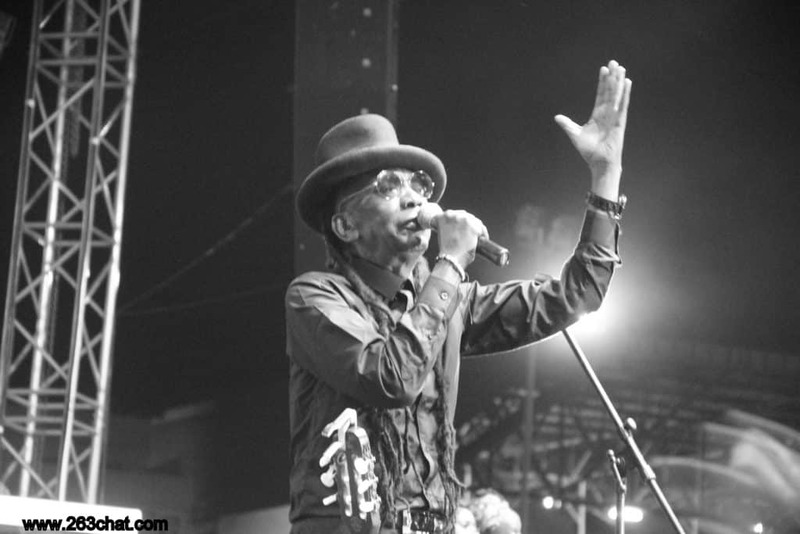 On the day of his show, music lovers had an overdose of Chimurenga music as the 72-year-old belted out hit after hit for more than 4 hours sending the crowd into frenzy. His performance proved why he is bitter with most young musicians-performance wise. His act could be mistaken for a CD because of the quality of sound despite the fact that some band members never worked with him up until the early hours of 29 April when the legend took to stage. It all started with Diana Samkange followed by Sulumani Chimbetu who did not disappoint the fans who flocked Glamis Arena in numbers to witness the return of a hero. Andy Muridzo must be angry with his gods for making him run in the opposite direction as missed out on a rare opportunity to perform in front of arguably one of the biggest crowds in Zimbabwe. And on the Monday after the Saturday show, Mukanya packed his bags back to his new base in Oregon, a satisfied man as Zimbabweans had warmed up to his homecoming. Even the government did not disappoint as the Minister of Sports, Arts and Recreation, Kazembe Kazembe had time for Zimbabwe’s most decorated musician. For Mukanya, Zimbabweans still love and respect you for the role you played pre and post the liberation struggle. The expectation from the generality of Zimbabweans who follow Chimurenga music is that the bond created will not be broken and such shows as the one held on the 28th of April will continue in future- so that people do not have to be starved of arguably one of the best performances by a local musician on home soil.